Guaranteed Asset Protection, sometimes called GAP Insurance, is a protection package that covers the difference between the actual car value and your loan balance in the event that your vehicle is declared a total loss by your insurance provider. In other words, if your brand new car is declared a “total loss” in the first year of ownership and you owe more than your insurance provider is willing to cover for the loss, your GAP policy will pay off the remaining balance (up to a certain amount; check with your GAP provider for details). Let’s take the above example and assume that 12 months into ownership, the vehicle is stolen and not recovered. Your insurance company would likely declare the vehicle a total loss. After some number crunching on their end, they will decide what the car’s “Actual Value” (ACV) is, and they will send a check to your lienholder (the lender financing the vehicle) for that amount. If that amount isn’t enough to pay off your loan, you will owe the lender the remaining balance. For example, if your loan balance is $18,000, but your car’s actual value is $14,000 (the amount your insurance provider will cover), you will owe the lender $4,000 in order to satisfy the loan. Did you put money down when you bought it? Whether you bought a new or used vehicle, having a down payment helps close the “gap” between the actual value and what you owe. Consider these two scenarios (for illustrative purposes only) – the “gap” is much more severe and lasts longer in the scenario with no down payment. Did you opt for the longer loan term (and smaller monthly payment)? It may be tempting to opt for the lowest monthly payment, but doing so typically means your loan term is longer. 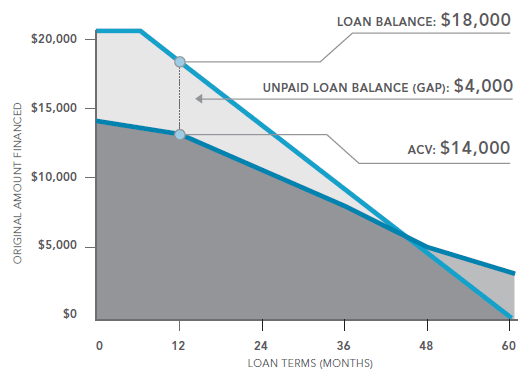 Stretching your loan out over more than the typical 5 years increases the “gap” between loan balance and vehicle value even more. Did you borrow more than the purchase price? Whether it was the extra features, add-ons, or even negative equity from your previous car, rolling extra money into your car loan can have a dramatic effect on the “gap” between your loan balance and vehicle value. Consider shopping several GAP options that offer the right amount of coverage for your situation. Have you refinanced your loan since you bought the vehicle? GAP policies follow the original loan policy, so if you’ve refinanced your vehicle since then and are still upside down, purchasing a new GAP policy may be wise. Did you roll tax, title, license, and other fees into your loan? Many car buyers opt to roll their back-end fees into the loan balance, but doing this increases the "gap" between the loan balance and the vehicle value early on. If you do this, consider also rolling in a Guaranteed Asset Protection package from Amplify. Where Do I Buy GAP? GAP is typically purchased at the time you finance the vehicle, but you can purchase it at any time after the fact. You can buy it through your lender, the car dealership, or even your car insurance provider, all of whom offer different levels of coverage for varying price ranges. Amplify Credit Union’s Guaranteed Asset Protection (GAP) is a one-time fee of $350 and covers “gaps” up to $7,500 for the life of the loan. Visit goamplify.com for more information about Amplify, or check out all of our Auto Loan Protection Packages.